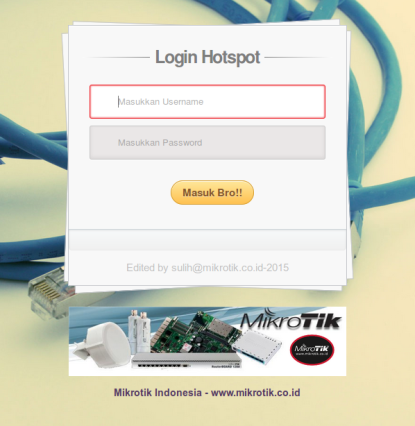 As we know that on mikrotik router has a hotspot feature. 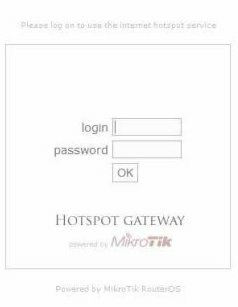 When we create a hotspot and try internet access through the hotspot point then we will be redirected to the login page for user authentication process. Well, where did the login page come from? If we look into the 'Files' in the storage router will be seen a collection of files with html extension. One of them is a file called 'login'. From this file the hotspot login view comes from. login.html It is a login page that is displayed for user authentication by entering a username and password. alogin.html A page displayed after the user has successfully authenticated. This page displays a pop-up of the status of the page whether 'Log In' or 'Log Off' and will also be redirected (automatically / manually) to the web page accessed by the user. rlogin.html A page that redirects a user from accessing the URL page to the login page, if the user requires autorisai to access. flogin.html A login page displayed when an error occurs. For example, when user incorrectly enter 'Username' or 'Password'. - If the user has not authenticated and access the web then it will be redirected to login.html page. - If the login procedure fails (either incorrectly enter the username or password), it will display the page flogin.html; If the flogin.html page is not found then the login.html page will be displayed. - If the user has been successfully logged (login), alogin.html will be displayed; ifalogin.html is not found it will be redirected to the web page accessed by the user or to the status page. In this example we will try to change the look of hotspot login. Actually from the hotspot system has been given default view. However, maybe among us want to change it to give a better view. Well, to change it, we will modify the script from login.html file. The file can be downloaded first from the router, either using FTP (Linux and Mac OS) or simply 'Drag & Drop' for Windows OS. 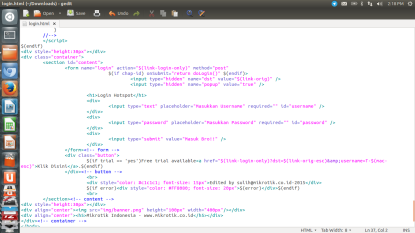 After we downloaded, we can do the editing on the script using Text Editor. Because the script uses HTML files, then at least we are familiar with the HTML language. Well, after we make modifications to the script, we are uploaded back to the router. The trick is also the same as we download, can use FTP or 'Drag & Drop' (Windows). And one example of a simple display that we make is like the following view.